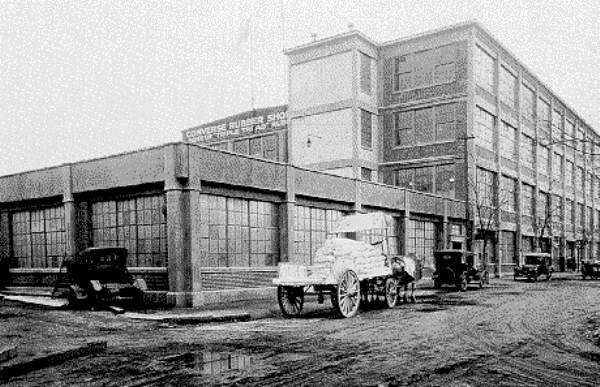 Marquis M. Converse started the "Converse Rubber Shoe Company" in 1908. Over a century later, the brand continues as a significant presence in the footwear business. 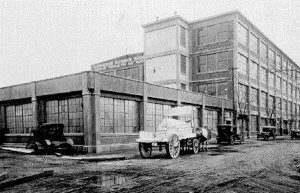 In the early days, this was the one-time manufacturing plant for "Converse Rubber Shoes." Note the horse-drawn wagon and the antique automobiles. 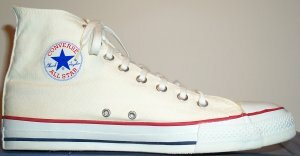 In the 1950's, Converse marketed their canvas sneakers with the slogan "It's Converse for Comfort." This 2003 Converse model features a replica of the original 1908 "Converse Rubber Shoe Company" logo. 1980: Allied - Allied became AlliedSignal in 1985, later merged with Honeywell International in 1999 and adopted the Honeywell name - a diversified maker of car parts, aircraft electronics (avionics), and even nuclear weapons. 1983: Allied spun off Converse. 1986: Interco - Furniture and footwear manufacturer. Later on, Interco changed their name to Furniture Brands International (makers of Broyhill, Lane, and Thomasville). 1994: Interco spun off Converse and Florsheim, their footwear businesses, as separate companies. 2003: Nike - famous athletic apparel and footwear manufacturer. 1915 - Converse branches out into sneakers. 1928 - Converse goes into receivership after a disastrous diversification into automobile tires. 1929 - Converse acquired by Mitchell Kaufman. 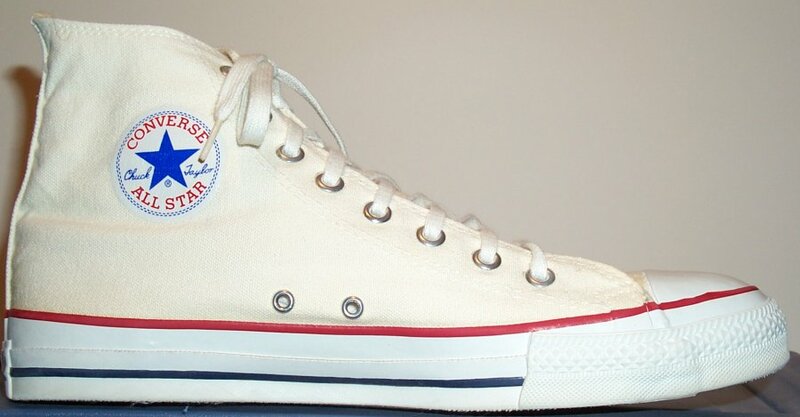 1932 - The "Chuck Taylor" signature added to the All Star basketball shoe. 1933 - The Stone family acquires Converse. 1971 - The Stone family (who started the Stone Charitable Fund of Boston as a philanthropic effort) sells the company to Eltra Corporation. 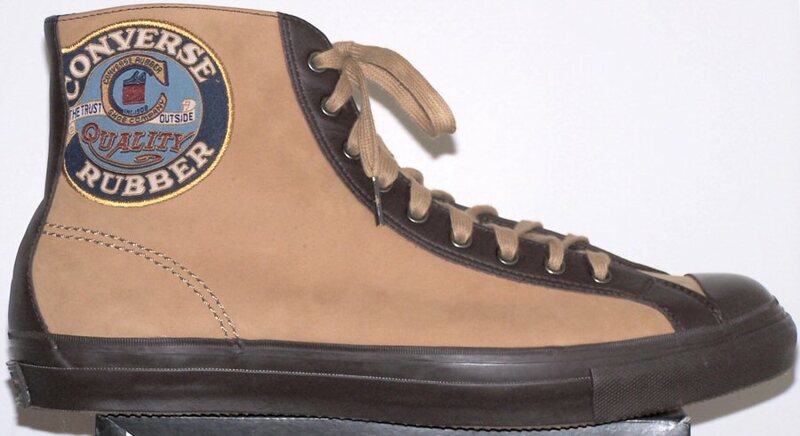 Eltra acquires the B. F. Goodrich footwear business and merges most of it with Converse; they are required by the U. S. Department of Justice to spin off the PF Flyers brand in the process. Charlie buys his first pair of "Chuck Taylor" All Star sneakers for gym class. 1975 - Julius W. Erving ("Dr. J") becomes a Converse endorser. 1980 - Converse parent Eltra becomes part of Allied Corporation. 1982 - Allied Corporation spins off Converse as a separate company. 1984 - Converse boxes proudly proclaim "Official Sponsor of the 1984 Olympic Games" after paying $1,000,000 for the privilege. 1986 - Interco acquires Converse. 1992 - First use of the "REACT" cushioning technology in Converse athletic shoes. 1994 - Interco spins off its footwear businesses (Converse and Florsheim) as separate companies. Refocuses on their product strengths: basketball, cross training, and "athletic original" shoe lines. Produces 5.2 million pairs of sneakers in the United States. Jumps the millennium four years early with the All Star 2000. Announces that over 550 million pairs of "Chuck Taylor" All Star sneakers produced; believed an industry record. Produces 7.5 million pairs of sneakers in the United States. Establishes its presence on the World Wide Web. Announces that over 560 million pairs of "Chuck Taylor" All Star sneakers produced. Produces 8.4 million pairs of sneakers in the United States. Celebrates ninety years in business. Has United States production drop to 5.6 million pairs. Introduces helium cushioning to athletic shoes. Announces that over 570 million pairs of "Chuck Taylor" All Star sneakers produced. Produces 3.9 million pairs of sneakers in the United States. January - Enters Chapter 11 bankruptcy. March - Discontinues manufacturing in the United States. April - Changes ownership from public to private hands; $117 million paid to the bankruptcy court towards their debt. July - First "Chuck Taylor" All Star sneakers made in Indonesia arrive in the USA. December - Then-current owners formally propose that Converse return to being a publicly owned company. July 9 - Nike announces that they will purchase Converse for $305 million plus the assumption of certain liabilities. September 4 - Nike acquisition completed; Converse now part of the Nike collection of "SWOOSH-free" brands (which also includes Hurley International action sports clothing and footwear). Over 1.1 billion shoe laces have been made, just to meet the manufacturing requirements for Converse "Chuck Taylor" All Star sneakers.